Horizontal, vertical, regional, national, large- and small-scale—2017 marked a year of mergers. They ranged in all shapes and sizes, from the national hospital system expansions charted by Catholic Health Initiatives and Dignity Health to the vertical combination of retail pharmacy giant CVS Health and insurer Aetna. And they all had one thing in common: trying to achieve scale and turn it into a financial and competitive advantage. But as healthcare executives tout the promise that the deals will lower costs and benefit consumers, economists and experts worry that misaligned incentives mean that consumers won't see those savings. "Let's be clear, just because an institution gets efficiencies and saves money doesn't mean that translates to lower costs and lower spending," said Dr. Stuart Altman, chair of the Massachusetts Health Policy Commission, which is tasked with reviewing the proposed merger between Beth Israel Deaconess Medical Center, Lahey Health and several other hospital systems that would create the second-largest healthcare network in Massachusetts. Five mega-mergers were announced over an eight-day span in early December, starting with CVS Health's planned purchase of Aetna on Dec. 3. The next day, Advocate Health Care and Aurora Health Care announced a merger that would create a $10.7 billion cross-state system, continuing the trend of providers realigning into regional hubs that give them significant market share. Advocate's proposed merger with NorthShore University HealthSystem couldn't overcome antitrust concerns regarding its redundant service areas. So Downers Grove, Ill.-based Advocate turned to the largest health system in Wisconsin in a proposed deal that does not involve any market overlap. On Dec. 6, the UnitedHealth Group agreed to buy dialysis provider DaVita's medical unit for $4.9 billion to expand the national insurer's outpatient care services. DaVita Medical Group's physician network provides care to approximately 1.7 million patients annually across six states in 35 urgent-care centers and six outpatient surgery centers. The following day, Catholic Health Initiatives and Dignity Health formalized a deal that would have—at the time—created the largest not-for-profit hospital system. The new health system would include 139 hospitals with operations in 28 states with no overlap in hospital service areas, similar to the Advocate-Aurora deal, and combined revenue of $28.4 billion, eclipsing Ascension's $22.6 billion. The marriage would test a newly popular co-CEO model that delegates certain roles between Lloyd Dean and Kevin Lofton. Not to be outdone, on Dec. 10 plans emerged of an Ascension Health-Providence St. Joseph Health merger, which would create the largest hospital system, as first reported by the Wall Street Journal. It would give the combined not-for-profit entity 191 hospitals in 27 states and annual revenue of $44.8 billion, ahead of HCA's $41.5 billion. Providence St. Joseph's experience with taking on risk through its insurance arm would benefit Ascension, said Miki Kapoor, president of Tea Leaves Health, a consulting and software company. "We are seeing the payers become providers," he said. "They are beginning to own more of the risk and get closer to the patient. These deals are happening because they are finally putting the consumer at the center of healthcare." Providers are speeding up their search for potential partners as they face financial pressures and expanding competitors, as well as a flurry of rising staffing costs. They are also coping with rising bad debt as more patients can't cover their high-deductible health plans. Inpatient admissions continue to wane as more care is delivered in lower-cost outpatient facilities and consumers increasingly shop around for cheaper care. 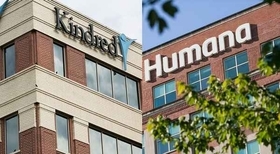 Looming policy changes that could slash the Medicaid and Medicare programs, the number of the insured and tax exemptions for not-for-profit providers are also vexing health systems that are budgeting for the potential additional costs. Some systems have even hinted at cherry-picking commercially insured patients. Negotiating better rates will help offset their losses from taking on more Medicaid beneficiaries as the population ages. But this is a tactic that can also raise prices for consumers. While many systems are reticent to take on more risk, they realize that the delivery system is moving to a more capitated model where providers get a fixed amount for a procedure or treatment plan and have to spend it more judiciously. Combining balance sheets would allow them to spread the cost and risk of building the infrastructure needed to deliver that type of care and maintain compliance. It would also help them satisfy alternative payment models that tie reimbursement to outcomes. The healthcare industry saw the start of another shockwave in 2017 as Amazon tiptoed into the healthcare supply chain. The e-commerce behemoth, which has used its logistical prowess and scale to upend many markets, has quietly established a growing presence in the medical supply sector. It has also received wholesale distribution licenses from several state pharmaceutical boards. The moves have led some companies to forge more mergers and acquisitions. But some health systems are learning that bigger isn't always better. Scale isn't paying off as quickly, or at all, organizations including Community Health Systems and Tenet Healthcare are shedding hospitals and other struggling assets that did not produce a return. These major tie-ups require a thoughtful approach to integration and combining cultures. One of the most important factors is how to align physicians to best deliver the right care in the right setting, particularly with high-cost patients with chronic conditions, said Sean Angert, national partner of consulting at Advisory Board. "Many hospitals have felt that cost related to managing that intake valve on the emergency department process," he said. "They have to think of an effective pre-intake and post-acute strategy to get them in the right setting, even if they don't own those assets and must develop relationships with others in the community."